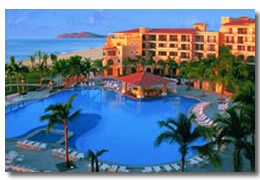 The Dream Resort in Cabo San Lucas is actually located in between Cabo San Lucas and San Hose Del Cabo. It over looks the Sea Of Cortez, and is adjacent to two championship golf courses. It's a very clean looking hotel. Traditional in it's Mexican design, and located along a sandy white beach on the Sea Of Cortez. Most of the rooms overlook the pool and the sea. You can here the waves all night from some of the rooms. Wake up first thing in the morning to the sound of waves. Just what a vacation to a Los Cabos beach resort is all about. El Patio - Enjoy some Fajitas at this beachfront terrace. Also serving you à la carte breakfasts daily with a buffet, dinner buffets and beach-party buffets. Portofino - How does the Spinach-mascarpone-stuffed chicken breast with grappa sauce sound to you? The restaurant has air conditioning, and you have to be smart to get in. Himitsu - If you are someone who enjoys Asian cuisine then dishes such as Japanese chicken teppanyaki should temp you into this restaurant. Smart dress again in here so you're eating your sushi in style. Oceana - This is the restaurant for seafood lovers. Cajun shrimp, and fish tacos and fajitas are spicy and go down well. All this can be eaten at candlelight. Sea side Grill - Eat in the open air by the pool here. It serves you à la carte lunches/dinners. Another Dreams restaurant with the candles at dinner for the romantics. There's more than enough to do during the day at this Los Cabos resort. In between your sun bathing you might get to do one or two activities a day. 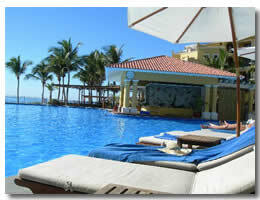 Then you can relax by the pool just to remind yourself you're on your Cabo San Lucas vacation. Get out early for a walk along the beach, about 7.00 if you can. The vendors aren't out this early so your walk will be a little more peaceful. You can't swim in the water which is the same with most of the beaches in Cabo San Lucas. This is due to undercurrents being too strong. It's a nice relaxing sunbathing spot if you're not bothered about going into the water. Golf fans have the luxury of two neighboring golf courses at the Dream Resort in Cabo San Lucas. You have the Jack Nicklaus designed Elderado golf course. You are blessed with stunning Sea Of Cortez views for six of the holes, and the other twelve holes lie between two canyons. The Cabo Real golf course is your other choice. An eighteen hole course designed by Robert Trent Jones II. Over seven thousand yards of golfing so a stop at the club house will be a welcome treat. This is located at the ninth hole.